1We often read of topics ranging from the details of local environmental planning to such potentially catastrophic issues as nuclear arms control being “under negotiation.” We may have some sense of who the actors are, from local officials to diplomats, and we may have a sense that talk, document drafting, and the ongoing navigation of technical issues play major roles in such processes. At the same time, for most of us, and for many scholars, negotiation itself provides something of a terra incognita. A great deal has been written linking antecedent conditions, political and otherwise, to outcomes. Rarely, however, do we get a sense of the specific topics, styles, and strategies that figure in such crucial interstitial conversations, or of the complex intersections of talk, text, and decision-making they encompass. 2Stefan Groth’s book introduces us, with remarkable insight and ethnographic texture, to the often invoked but rarely deeply explored processes of diplomatic negotiation and into the routine communicative practices central to such activity. 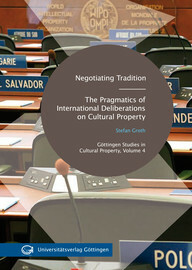 More specifically, he brings a breadth of methodological perspectives together to focus on the “negotiation of tradition” at the World Intellectual Property Organization (WIPO): How are decisions made, avoided, or transformed regarding the intellectual property status of “traditional knowledge and traditional cultural expressions/folklore” in this major transnational agency? And how do the specifics of quotidian talk in such cases speak to the larger political, commercial, and community interests that often figure more centrally in academic models of such decision-making? 3In part his work reflects his strong core training in cultural anthropology, and especially his intense engagement with his colleagues in the Göttingen cultural property research group. It also draws very effectively upon recent social anthropological research on complex organizations. In particular, his research resonates with an emergent scholarly commitment to the ethnography of transnational regulatory regimes, whether in official institutions such as the United Nations and its derivative offices or in less formal nongovernmental organizations, parastatal agencies, and ad hoc entities. There is a great deal of significant and pathbreaking work being done in such sites, research that certainly challenges more orthodox organizational studies of these institutions. At the same time, Groth’s work is utterly original, in part because of a third scholarly strain he brings to the work, that is, a thoroughgoing commitment to the detailed analysis of communicative practice at WIPO, a perspective grounded in linguistic anthropology. 4The underlying argument of Groth’s book begins with his emphasis on the signal importance of the sociolinguistic practices through which negotiation is constituted. He argues compellingly for the revelatory role of an “analytical triad” that brings together institutional ethnography, micro-linguistic analysis, and a thorough examination of those macro-processes, incentives, and constraints central to the broader context within which negotiation takes place. While institutional ethnographers often invoke the importance of negotiation, their analyses usually remain more or less metaphorical; they rarely grapple with the language through which such key work is accomplished. Groth not only focuses on such language, but he does so with a rich and subtle sense of the complex interworkings of meaning, style, social positioning, and indirection characteristic of such talk. This is linguistic anthropology of a very high order indeed. He has read widely, and with insight and imagination. His engagements with and uses of the work of key scholars are among the most lucid and generative I have read in recent years. Further, his innovative refigurings and applications of such concepts as shifters, “fractal recursivity” and social differentiation, intentionality, and speech community are sophisticated and fresh at the same time. In the United States, where there has been a much longer tradition of linguistic anthropology than in Europe, language specialists have only recently turned their research to the kinds of complex institutions at the heart of Groth’s work: here again, his book provides a broadly applicable model for research of real value for scholars on both sides of the Atlantic. 5Groth clearly demonstrates the value of his “analytical triad” through very detailed examinations of a range of recurrent communicative events and speech and documentary performances at WIPO. He argues that WIPO constitutes a “nascent” or always emergent speech community, that is, a collectivity that is always working to shape shared understandings not only of what their talk means but also of how it might most appropriately and effectively be pursued. In his examination of such occasions as formal meetings, hallway conversations, faction gatherings, and cocktail parties, Groth also explores such key features of WIPO talk as indirection, courteous evasion, and the multiple communicative manifestations of that constant tension between those delegations that use language to stall forward motion on binding legislation and those that work with equal energy to move towards regulatory closure. While his focus is on spoken language, he contextualizes all the talk within an extraordinary welter of well-explored documentary and document-making practices. In fact, the complex relationship between talk and text-making is at the political heart of WIPO’s work. Groth is an acute and reflective ethnographer, one who consistently demonstrates great eyes and ears for telling materials. And he turns the materials of such ongoing interaction around to cast a strong and interpretively invaluable light on the broader life of the institution and of the transnational political economy in which it figures so significantly. 6Negotiating Tradition illuminates or, perhaps more appropriately, makes audible the talk at the heart of WIPO. The talk itself, variously oblique, candid, and redundant, shaped by recurrent resistance and collaborative courtesies, is fascinating, and the interplay of formulaic performance and intentional strategy emerges elegantly. This is a compelling account in its own right, a clear-eyed, open eared, and subtle ethnography of a complex and consequential transnational forum. It also models, with principled imagination, what such an integrative perspective might bring to our own work. BRENNEIS, Donald L. Preface: Up for Negotiation In : Negotiating Tradition : The Pragmatics of International Deliberations on Cultural Property [en ligne]. Göttingen : Göttingen University Press, 2012 (généré le 21 avril 2019). Disponible sur Internet : <http://books.openedition.org/gup/611>. ISBN : 9782821875456. Brenneis, Donald L. “Preface: Up for Negotiation”. Groth, Stefan. Negotiating Tradition : The Pragmatics of International Deliberations on Cultural Property. Göttingen : Göttingen University Press, 2012. (pp. I-III) Web. <http://books.openedition.org/gup/611>. GROTH, Stefan. Negotiating Tradition : The Pragmatics of International Deliberations on Cultural Property. Nouvelle édition [en ligne]. Göttingen : Göttingen University Press, 2012 (généré le 21 avril 2019). Disponible sur Internet : <http://books.openedition.org/gup/608>. ISBN : 9782821875456. Groth, Stefan. Negotiating Tradition : The Pragmatics of International Deliberations on Cultural Property. Göttingen : Göttingen University Press, 2012. Web. <http://books.openedition.org/gup/608>.